So it is mid January and you need some strong warm sun on your back, a chance to have a daily swim and a round of golf. Well, Paphos in Cyprus is the place for you. With direct flights from Helios Airlines out of Dublin airport and a great selection from the Cyplon Holidays brochure you can banish the winter blues and prepare for summer with a decent tan to boot. It was late November when I travelled to sample the delights of this southeastern part of the island of Cyprus and delighted I was. Situated just 15 minutes from the airport, Paphos has a natural beauty, great historical values and legendry charm. With leisure options galore and modern facilities Paphos (Pafos in Greek) is the definative year round destination for sun lovers, nature friends, golfers and anyone seeking an escape from everyday life. It will fulfill all your hopes and promises. The Alexander Beach Hotel was where I laid my cap. A 4 star-hotel it offers its guests an exceptional combination of excellence, style, service and unrivalled facilities for families, couples and singles of all ages. It boasts a blue flag beach overlooking the harbour and its castle. Here you can swim in shallow safe waters under the attention of a swim guard. The hotel has been recently renovated with its top-quality restaurants, a tavern and indoor and outdoor swimming pools. There are also great facilities for children with their own supervised pool and kindergarten. For the adults there is a health club. Every room has a mini bar and satellite television. And of course if you are a smoker your can request a designated smoking room. If you have a spare day visit the Paphos Amathus Beach Hotel and see how the other half lives. A hotel built in unique monastic architecture and classical interior design, it achieves a subtle blend of intimacy. This superb retreat just two miles from the harbour has its own beach and is surrounded by lush gardens. Worth a visit just to admire and have a cool cocktail. Next time I visit, and that’s a promise I have made to myself, I will try out the Columbia Beach Hotel nearby in Pissouri. Tucked into the mountain and beside yet another blue flag beach, it is modelled on a traditional village offering 94 deluxe suites all exquisitely appointed to the highest international standards. This unique oasis of peace and tranquility also offers a full exclusive range of facilities, swimming pools, restaurants and bars. But its real beauty, because of its location, is the peace that you can almost hear. And then of course there was the golf with three championship courses to choose from. They are the aptly named Aphrodite Hills, Tsada Golf course and the Secret Valley course. You can book during the winter months from about 7am with darkness falling about 17.30 under the most amazing sunsets. The Aphrodite is a golfers fantasy tucked away in the rugged landscape with spectacular tee positions at the edge of cliffs. You don’t make the green, you lose your ball. My playing partners all choose to play such tee positions from the back sticks. A total distance of 6,269 meters with par at 71. Tsada Golf club was founded in 1994, set in the grounds of a 12-century monastery plays to a par of 72 and measures 6,060 meters. Its sister course is Secret Valley and is only 18 km from Paphos and of course is near the “Petra tou Rpmiou” the legendary birthplace of Aphrodite, the goddess of love. It is set in a scenic valley with grand trees and beautiful rock formations all round. Measuring 5,904 meters it has a par of 71. For the golfer all three courses are a must. Be advised to take a buggy as some of the holes are not only challenging but daunting to walk on. Facilities at the three courses are top class with swimming pools and restaurants and bars. Golf club hire is available at all three. You should ask your travel agent to make all your bookings for accommodation, car hire and golf before you depart. Cyplon Holidays brochure is available from travel agents. But again many of Ireland’s travel agents and staff have up to date knowledge and expertise on Paphos and other regions of this beautiful island. All the main roads connecting the leading resorts in Cyprus have now been completed, both in the eastern and western parts of the island, blessed with beautiful beaches and good weather all year round. More and more Irish people are discovering Cyprus every year, and it is easy to see why. And with the completion of the third golf course, Aphrodite Hills Golf, it means Cyprus has even more to offer Irish holidaymakers using the new direct air links to the island. 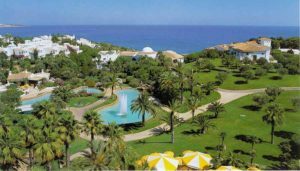 The golf course was developed by Lanitis Development Ltd and features a clubhouse with bar and restaurant facilities, and fine views over the Mediterranean from its terraces. Don’t wait for the football to plan your visit. Whether culinary or cultural (or both, as is often the case), are compelling indeed. You can also recharge your batteries in a world-class thalasso therapy spa, dine like a prince in a five star resort or party in glittering seaside cities like Lemesos, Paphos and Larnaka. Here, treasures of antiquity coexist with a modern, forward-thinking culture that surprises only by its sophistication. Whether you choose to relax simply or in high style, the options are almost endless. Bring the togs for Petra Romiou, more popularly known as Aphrodite’s Rock. According to legend, it was here that the ancient patron goddess of Cyprus first emerged. Couples who swim around the imposing outcrop are guaranteed eternal love. For those allergic to quiet, Ayia Napa is the hyped-up, psyched-up resort on the opposite side of the island, the Place To Be, particularly during high season when the former fishing village becomes a clubbing capital. See an ancient theatre clinging to a seaside cliff (Kourion), a monastery managed by cats (St Nicholas), a string of golden beaches along the island: Dare to discover all the myriad treasures that Cyprus has to offer. Just don’t forget to relax. Golf and sun are not the only things Cyrpus has to offer. For the culture vulture or the beach bum Cyprus is an equally impressive destination. Paphos is mosaics to the ears of Irish holiday-makers. 1 Paphos. Most famous for its mosaics, considered the best in the world and usually dedicated to Dionysus, originally laid down in the 3rd century as floors for Roman nobles. The first of these was uncovered in 1962, and continuing excavations have revealed an extensive complex of lavishly decorated buildings. Among the souvenir shops you’ll find Saranta Kolones, a Lusignian fortress destroyed by an earthquake in the 13th century. Check out the nearby Tombs of the Kings, 2km north of Kato Paphos, are a warren of fascinating tombs carved into the soft rock of the sea-cliff between Brent and Bewicks. 2 The mountains of the Troodos region, in the country’s south, are unforgettable and although close to the main resorts this is one place where you might not be outnumbered by package tourists. Popular with skiers, hikers and the heat-intolerant. 3 The Akamas Peninsula, on the west coast, is one of the last wild and unspoilt places on the Cypriot Coast. The landscape is a patchwork of barren rock and lush vegetation, with a wide variety of flora and fauna, including some rare species. It’s a great destination for walkers, with a network of paths criss-crossing the peninsula starting at the famous Baths of Aphrodite. 4 Kolossi Castle towers over a landscape of vineyards. The castle was built by the Hospitallers (the Order of St John of Jerusalem), who were granted land here in 1210, and for a while this was their headquarters. The Castle was restored in 1933 by The Brits. 5 Polis is a charming and serene base for exploring the surrounding area. It’s also a great place to hire a mountain bike, motorbike or car. It is set among citrus orchards and surrounded by spectacular scenery.